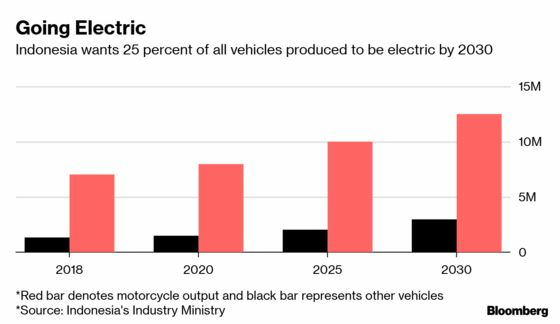 (Bloomberg) -- Indonesia is seeking investment from Renault SA and Volvo AB to make electric vehicles as the country targets battery-powered automobiles to account for a quarter of the production by 2030. President Joko Widodo has promised tax incentives to draw foreign investment in electric vehicles while also making it expensive to own fossil fuel-powered automobiles to save the country about 798 trillion rupiah ($56 billion) from reducing dependence and imports of crude oil. While Hyundai Motor Co. and Volkswagen AG have shown interest in manufacturing electric vehicles, a consortium of Chinese and Indonesian companies is already building a battery plant, according to Industry Minister Airlangga Hartato.